I absolutely loved this book. As I told a friend, the writing is perfect capturing the two separate time periods in which the novel takes place, and the language is lyrical. The characters are compelling, and it’s got a bit of everything, romance, friendship, mystery, intrigue, and even a dash of the paranormal (but only a dash). In many ways, author Miranda Beverly-Whittemore has written two novels, and woven them together in June. 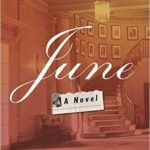 In 1955, which is June’s story as seen through Lindie’s eyes, we are treated to a coming-of-age story that involves love, loyalty, and what happens when a Hollywood production takes over your town – and your life. I confess that of those two characters, I preferred Lindie, as she seemed a lot more grounded, and was a breath of fresh air to read. At the end, it’s Lindie who seeped into my brain. The other story is contemporary: Cassie Danvers has inherited her grandmother’s crumbling old manse, Twin Oaks, and claimed it as a refuge, of sorts, from a bad relationship and a stagnating life. She’s at the point where she has to face her lack of funds when she’s told about another inheritance, this time from the star of the movie that so absorbed Lindie and June (her grandmother) sixty years before. His daughter and her half sister burst her bubble of safety almost immediately, and Cassie must fight to keep the house she so loves, while learning all the secrets of the past. In anyone else’s hands, this novel would probably descend into Lifetime Movie of the Week territory, where everything is over-the-top. Fortunately, Miranda Beverly-Whittemore’s touch is both delicate and deft. As I said above, she writes with a lyrical ease, and I especially enjoyed the way she handled dialogue. One convention that I enjoyed, but I know others are less on-board with, is that the novel opens with the house – Twin Oaks – giving its own point of view. As someone who has spent a lot of nights in old houses, I really appreciated that touch. Not only did the house serve as the focal point of the story, but its presence as a character in its own right really became the glue that held each part of the narrative together. It is this dash (and it really is just a dash, the merest hint) that makes this novel edge into magical realism territory, but it’s the same conceit that makes the story so special. Like Cassie, I wanted to hole up inside Twin Oaks, and breathe life back into the old estate. Unlike Cassie, I’m sorely lacking obscure, rich, relatives who will leave me their fortunes. Goes well with espresso served in vintage demi-tasse and Stella D’oro anisette toast. Three ways to enter: 1) Find my tweet about this book and retweet it (I’m @Melysse). 2)Find my Facebook post about this book (it’ll come from Twitter) and like/share it (I’m MissMelysse). 3) Leave a comment here on this post telling me about a house you love. Contest is open until 11:59 PM CDT on Monday, June 20th. 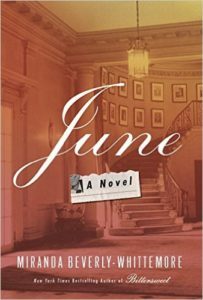 June, by Miranda Beverly-Whittemore – Review & Giveaway by Melissa Bartell is licensed under a Creative Commons Attribution-NonCommercial-ShareAlike 4.0 International License. I love the house where my mother lives, where my father lived, too, before he died almost four months ago. I never lived there, though, but they built this home on a lake in the woods thirty years ago, so it has been in our family for a long time. From the front, the house looks like an English cottage. In the spring and summer, my mother has always tended to a beautiful garden. From the back, the house looks large, with an open basement and mostly glass walls. Inside the house is enormous and comfortable. The house includes seven acres of property. The house will be left to their children, but there are five of us. A house with charm, warmth, character and a cozy feel is the house that I love. I had to leave this cottage when I moved away and I still think about it with fondness since it was the first house that I bought and felt comfortable and settled in. My favorite house is the cabin my dad and mom built from ground up. We spent 10 summers there. mostly playing outside and enjoying all that nature had to offer. I can’t think of a particular house that I love above all others; however, I love to visit historic homes and there is always something unique to each one that ends up appealing to me. I love my house! It is 110 years old, which in my neck of the woods is ancient. It is well-loved and tended to by my handyman husband who has worked constantly on it for the 30 years we have lived here. Both my children were born and raised here, and we even think we might possibly have a ghost! It’s a lot of work, but I can’t imagine living anywhere else.